THIRTY-FOUR AND A HALF PREDICAMENTS! How about a sneak peek scene? Neely Kate’s head whipped around to look at me, her eyes wide with surprise. “But this…” Beulah waved the card at me, and my face burned with embarrassment. “I think you two make a lovely couple.” The voice behind me sent ice water through my veins. I stared at her in shock. 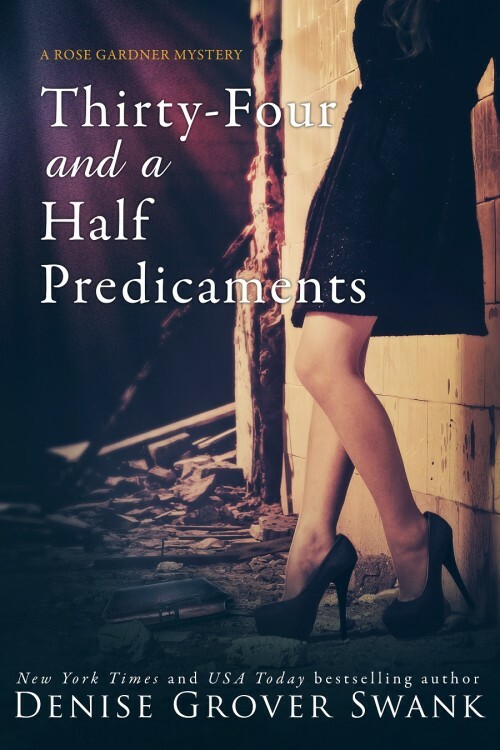 While she’d moved to Henryetta to try to convince Joe to resume their volatile relationship, she’d made it perfectly clear that she considered the town equivalent to a third-world country. The fact that she would not only slum it by going to a Henryetta hair salon, but she’d tell her friends about it, was jaw-dropping. Although I had serious doubts she was capable of having friends. Hilary was still holding a fake smile in place, but it looked like the effort of holding it would give her a headache. Every woman in the salon was watching our exchange with open mouths. Beulah could have sold tickets at twenty dollars a pop and she would have sold out in thirty seconds flat. But as Neely Kate had pointed out when we were looking for her missing cousin a month ago, the hair salon was the absolute best place to get caught up with the town’s gossip. And we sure were putting on a show. The women began to murmur. I heard the bell on the door ring, signaling the arrival of yet another gawker. Hilary stepped back and shot a glare at Joe’s sister, Kate, who grinned back like the Cheshire cat. She’d shown up in town right after Christmas. Rumor had it she was taking up residence at the nicest motel Henryetta had to offer. I had no idea why, other than she seemed to be snooping around about anything that had to do with Joe. Violet, who had more contact with Joe than I did, said he was aggravated by his sister’s sudden appearance and had very little to do with her. She’d been in the nursery when Neely Kate collapsed. And although she’d been antagonistic before the trauma, she’d insisted on riding to the hospital with us in Joe’s sheriff’s car. She’d even stuck around to try and make me feel better in the waiting room. I hadn’t seen her since, but I’d heard she was still around. I started to answer, still in shock that this was happening, but then I came to my senses. What was Mason gonna think if he heard about this? “Neely Kate, we need to go.” I pulled on her arm, but she refused to budge. “What?” I gasped in horror. Hilary’s mouth pinched into a tight line, making it clear she didn’t intend to say one word. I was grateful for her uncharacteristic silence; I had no desire to hear anything about Mason from her. O.m.g. wow. Just wow. I can not wait!! I think I might even pee my pants waiting for this. Just too excited!! Woah! Mason and Hilary? Just… is it tomorrow yet? You know when you tell yourself you’ll eat one piece of the chocolate block. And you have one piece and go into a frenzy and eat the whole lot. Well this teaser feels like this but I can’t eat the whole block and it hurts lol Denisssssseeeee! Sounds so good! Can’t wait for tomorrow!!! So many fascinating and engaging characters and storylines….anxious to read about Him-monster and Mason…May go back to team Joe.but…he has to grow a pair! WOW!!! That makes the anticipation for tomorrow worse! Now another twist Hillary and Mason, hmm?!?! Finally, Mason isn’t the good ole boy everyone thought…lol LOVE IT! Ok. Counting down the hours…… TicToc… Such a teaser. Need to know more! Holy moly! That was unexpected! Can’t wait for tomorrow! I think I feel a cough coming on, maybe I should stay home from work.